Movie Review: Executive producer, Alex de la Iglésia, presents a psychological horror film, set in ‘50s Spain, about two unstable sisters with a complicated past and present. The film was passionately directed by Juanfer Andrés and Esteban Roel, two newcomers who also co-wrote with Sofia Cuenca based on an original idea by Emma Tusell, editor of the last Spanish cinematic sensation, “The Magical Girl”. Relying on the extraordinary performances by Nadia Santiago and especially Macarena Gomez, the story feels simultaneously familiar and tonally consistent, if occasionally fluctuating in pace. Montse (Gomez) always played the role of a protective mother regarding her younger sister (Santiago), who she calls ‘la Niña’. Both live alone in a comfortable apartment after the death of their mother and the mysterious disappearance of their father 14 years before, during the war. The latter (Luis Tosar), religiously strict and morally judgmental, often visits the subconscious of Montse, a neurotic dressmaker who never goes out due to suffering from agoraphobia. Besides, Montse is a victim of other strange attacks, acting very aggressive and severely punishing her sister who just turned 18 and meets with a boy right under her window. This fact brings about jealousy and fear of loss in Montse who keeps inflicting guilt and embarrassment in the frightened yet courageous girl. Secluded, petty, and haunted by a traumatic past and an overwhelming awe of God, the older sister gains strong hopes of recovering, besides the drops of morphine that a client brings to her, when she literally kidnaps her neighbor, Carlos (Hugo Silva), after he has asked for help with a bump in his head and a broken leg. 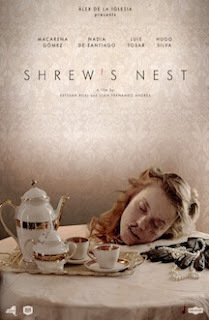 Even if not totally fresh or devoid of missteps, “Shrew’s Nest” reserves good surprises for the last 30 minutes, time when the gore images assault you, well programmed to enhance the climax. More morbid than creepy, this is a palpable psychological material whose major faults can be easily forgiven.